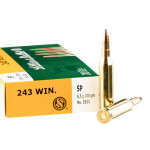 Derived from a necked-down .308 Win casing, the .243 Winchester is a handy cartridge effective against everything from varmints to deer and boar. 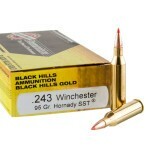 Introduced in 1955 and first chambered in the Winchester Model 70, it is one of the most popular sporting calibers in the US. 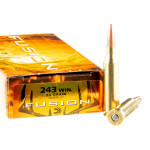 The .243 Win is well-liked for its dependable performance, flat trajectories, and relatively low felt recoil. 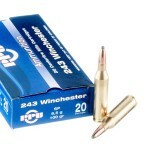 This latter property means that many rifles chambered in .243 Winchester can be made relatively light and easy to carry for long hours in the field. 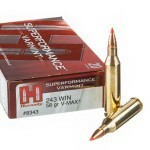 The .243 Win's versatility means a wide variety of loadings are available. 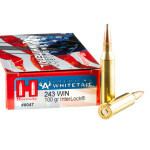 A round of .243 Winchester ammo may fire a bullet weighing anywhere from 55 to 115 grains, with muzzle velocities also varying widely from 3,000 to 4,000 feet per second. 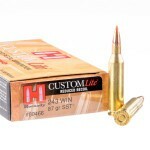 As with other hunting calibers, the lighter bullets are optimized for rapid expansion and elimination of coyotes and other small pests, while heavier ones deliver deep penetration and superior lethality against larger animals. 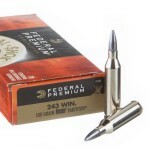 Varmint loads tend to use fragmenting hollow points, while deer rounds typically feature soft point bullets (sometimes polymer tipped) that expand for terminal effect but do not break apart and damage more meat than necessary. 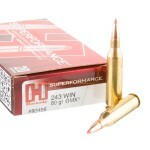 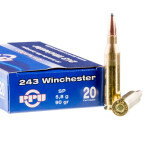 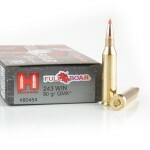 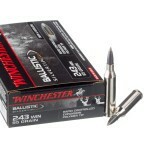 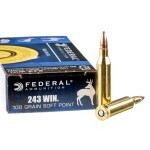 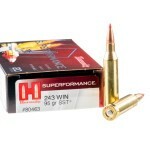 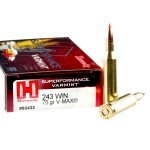 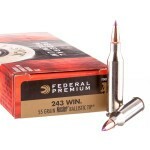 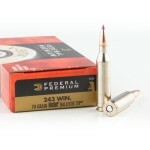 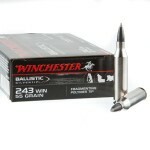 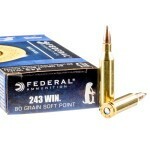 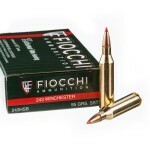 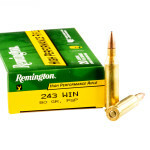 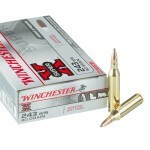 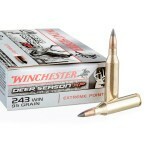 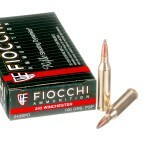 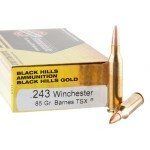 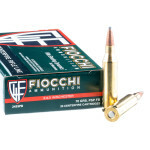 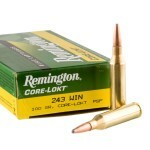 .243 Winchester ammo is available from almost every manufacturer. 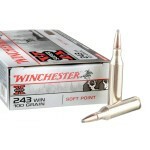 The vast majority of this ammo uses soft or hollow point bullets, in keeping with the round's sporting popularity. 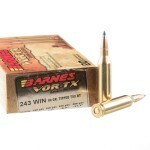 Solid copper projectiles are also available from Hornady and Barnes. 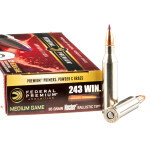 While somewhat more expensive than traditional ammo, these produce very strong performance and are particularly advantageous for meat hunters, as they do not pose a risk of lead contamination.